Wonder if this is where Cabbage Patch Kids got started? Probably not. 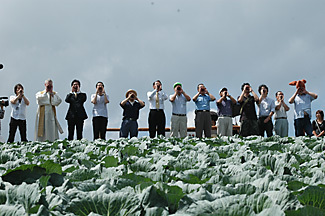 After all, there’s a whole cabbage field in between them. The movement was begun four years ago. Today they have 150 members. A veritable tsunami of support, hm? People don’t believe me when I try to explain the Japanese way of showing affection, or not, as the case may be. Check out this article for some interesting insights into the country of my birth.